Lucy just loves shower time…as long as she is OUTSIDE the shower! 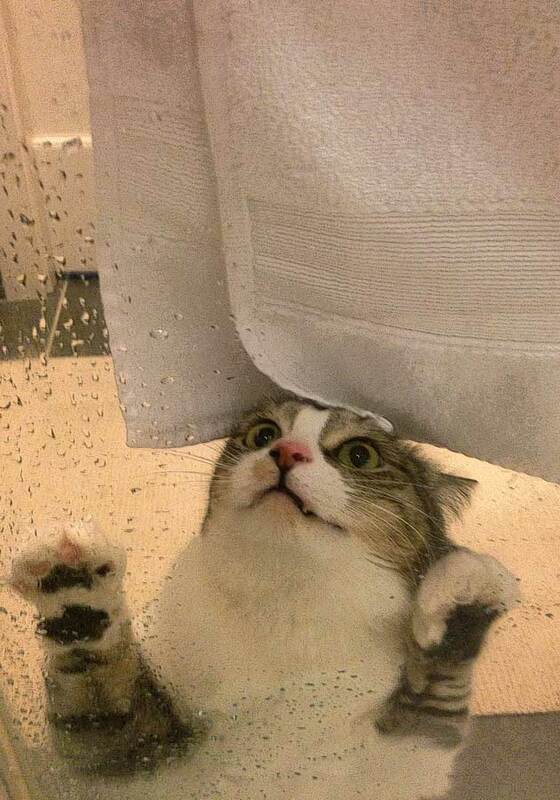 This entry was posted in Pets, Wordless Wednesday and tagged cat, Mischievous, Shower. Bookmark the permalink. Oh, no! Lucy, we hope your day got better after the shower. We are stopping by for the first time to meet your kitties and doggy. Just like most cats, they all think they rule. We know cats rule, and they rock too! Lucy is very cute. Our mom and Astrid had a similar experience this morning. Mom will probably post a photo in the next few days. We look forward to stopping by again, and we hope you’ll visit us at http://www.thecatonmyhead.com. Purrs and hugs, Lily Olivia, Mauricio, Misty May, Giulietta, Fiona, Astrid, Lisbeth and Calista Josette. P.S. Your web-site/blog title are the best! Thanks for stopping by! My cats do rule – except at night when they all clear the floor for my dog Gracie and playtime with her Red Thing (aka Kong toy), which bounces in every direction. I will definitely visit you. Can’t wait to meet your crew! lol… that is just so funny! I hope your camera is waterproof! Yep, considering when I took the photo the water had just been turned off! OMG – Gracie would be freaking out just having running water that close. Benjamin Bunny would be licking the window. Great photo! I know how you feel Lucy, I try to hide when I know it’s imminent! !